+ Scroll Concerning A brief Elisian History . . . The heritage of this demi-human race has been slowly forgotten throughout the ages. Because of the combined turmoil of the recent centuries; the loss of both their immortality and the only legitimate heirs to their throne, this ancient race's influence has diminished on Asora. Long ago when the world was still whole, the elisians, the favored children of Nessra, arrived among the lands of humanity to spread the faith of the Blood Goddess. Yet, when Haven underwent the Sundering, elisian ties to their homeland were severed, and in time, that distant land became all but a memory. Having been devout in their reverence of the Blood Goddess Nessra in antiquity, the elisian’s tendency for worship eventually influenced their acceptance of the Angelic Host as their new pantheon of patron deities. Adopting the Archangels' tenets against the creatures of Hell, the elisians waged an idealistic crusade against the Belkhanid Kaliphate which ruled Asora through demonic pacts. Thankfully, their persistence eventually led to the Belkhanid's downfall, inspiring the spark of rebellion among the slave tribes that would one day form the modern realms of the Jeweled North. Where their hatred for the unholy once led to the destruction of an evil empire, this same revulsion has in turn led to their own misfortune. When the eldest heir to their kingdom was discovered practicing dark magic, the ensuing upheaval left the elisian people without direction. With the last king dead, the elisians grow restless, awaiting the return of a ruler to guide them out of their age of idleness. + Scroll Concerning Elisian Physiology . . . In most aspects, an elisian is indistinguishable from a human, save for the bright illumination of their eyes. For whatever reason, the historic event referred to as the "Dance of Demons," left the elisians without their naturally endowed immorality. To replicate their lost longevity, they consume a life-extending formula of Refined-Dust, a substance which consequently gives an elisian’s eyes a bright blue or yellow illumination, nearly absent of iris. Their bodies tend to be lithe, bearing a fair or pale complexion. An elisian's hair is almost always of an autumn hue, usually a rich brown, but not excluding deep blondes, auburns or maroon colors. On rare occasions elisians are born with black hair, a quality perceived as a dark omen linked to an older time. Elisians are capable of growing facial hair, but like their hair, but tend to keep it shortly worn and groomed. To distinguish themselves from the lower classes, both the theocrats and nobility bear one additional trait. Those of high birth have their ears deformed during infancy with a series of molds and bands so that they become drawn out with a definitive point at their crest. To elisians, this pointed shape is not only a sign of status, but synonymous with the race's concept of beauty. + Scroll concerning the Elisian Personality . . .
+ Scroll concerning Elisian Lands . . .
Before the Sundering of Haven, the Ta'Eldae Tablelands were known as the High Forests, but have since become a series of barren plateaus plagued by lightning storms. In the recent past, the elisians were governed by a king and subservient theocratic lords, each with their own regional domain. In the absence of a king and the unfortunate exile of the elisian princes, the theocrats have formed small autocratic principalities within the realm. They are able to maintain their authority due to the local clergy's function as dispensersof Refined-Dust to the impoverihed, free of charge. Fearful of the deadly storms which lay waste to the plateaus of the Tablelands, elisians build hanging cities between the bluffs, or likewise, carve their homes directly into the stone. It is in these ingenious places that they escape the looming threat of lightning, and avoid the dark regions beneath the plateaus. Those sea level places between the mesas are collectively referred to as the Wound. It is an area normally avoided by the elisians for fear of the terrible beasts which hunt tirelessly in its shaded darkness. + Scroll concerning Elisian Religous Practices . . .
Only a handful of scholars know that elisians were once members of humanity, altered by the Blood Goddess Nessra to act as her faithful servants. However, after the passing of thousands upon thousands of years, the elisians found themselves lost to their old ways and adopted the Archangels as their protectors. While most encourage devotion to the Archangels, some elisians belonging to mystery cults still meet in secret to worship Nessra. Of the Angelic Host, it is the Archangel Ka'el who embodies their belief for a peaceful world free from evil. Originally it was the elisians who spread the beliefs of the Archangels across Asora. It was they who instructed the human slave-tribes that would one day form the great powers of the Jeweled North in the holy ways of the Angelic Host. + Scroll concerning Elisian relations . . . The elisian capital is located farther south than any other civilized power. This location hinders them from holding strong political ties to other places on the map. Despite their distance, elisians tend to travel to Falador, since it was one of their exiled princes who founded that city-state. Others of their race find regular work in Arkomat and the Savage South, acting as guards, scouts, rangers or merchants transporting Refined-Dust shipments. Elisians who travel outside the Tablelands find the company of humans to their liking, but believe humanity's easily corrupted nature disquieting. They are indifferent to the other races due to lack of contact, but utterly distrust all kargaur because of their demonic origin. + Scroll concerning elisian linguistic practices . . .
Elisians who remain within the Tablelands speak nesaenae, the ancient language of their race. Due to their long life-spans, elisian’s tend to pick up other languages such as auldtangue, and most commonly, the Free Speech of norstari from the Jeweled North. + Scroll concerning Elisian Naming Conventions . . . Upon birth, each elisian is given both a common name, and a second name which had belonged to a respected grandparent. It is believed that by sharing a name, the grandparent will return to safeguard the child, providing the newborn with a patron spirit to guide them. Only those of noble blood are given a family name. Nessra's Favor: As the descendents of that race who was elaveted by the Blood-Goddess Nessra to act as her chosen servants, elisians receive +2 to their Spirit skill. Dust Addict: An elisian must consume at least one Vial of Refined-Dust (20gp) per week in order to replicate their lost immortality. For every week an elisian goes without quenching their need for Refined-Dust, their max Vitality Score is reduced by 3. Should their max Vitality Score reach a value of 0 or lower, that character succumbs to the pain and dies from their withdrawals. Age: Elisians mature at the same rate as humans, but they’re considered young until they reach the age of 100. Although they were once immortal, no one is sure how long an elisian can live while consuming Refined-Dust. A handful of elisians are now upwards of 1000 years old, but they numbers are few. When an elisian stops consuming Refined-Dust, their quality of life until they die of withdrawals a few weeks later. Alignment: Most elisians love and treasure the tenets of the Angelic Host, and often see themselves as the stewards of the faith. They value and protect others’ should their values mirror their own, being more often good than not. Size: Elisians stand between 5 and 6 feet tall and average about 150 pounds. Their size is Medium. Fleet of Foot: An elisians base walking speed is 35 feet. 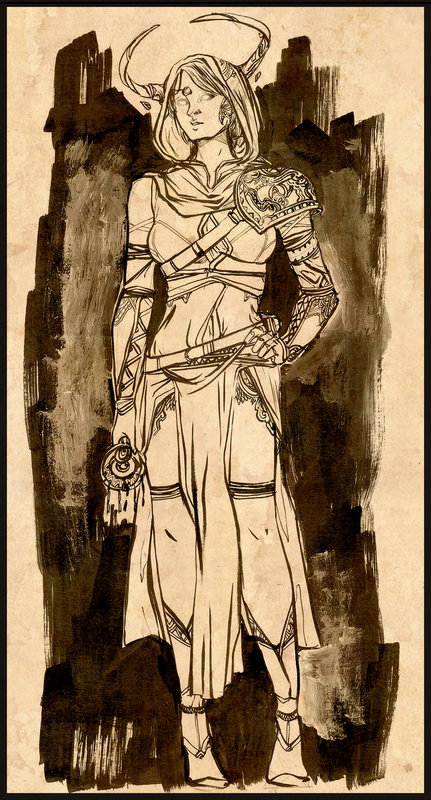 Nessra's Favor: As the descendents of that race who was elaveted by the Blood-Goddess Nessra to act as her chosen servants, elisians receive advantage on all Wisdom Saving Throws. Dust Addict: An elisian must consume at least one Vial of Refined-Dust (25gp) per week in order to replicate their lost immortality. For every week an elisian goes without quenching their need for Refined-Dust they gain a level of exhaustion until they eventually die from withdrawals. Elisian Combat Training: Elisians are proficient with longswords, shortswords, shortbows, and longbows. Crusading Heart: Accustomed to struggle against dark forces and their followers, elisians have advantage on saving throws against being frightened. Tool Proficiency: Trained by the tall plateaus of the Ta'eldae Tablelands, elisians are proficient with climber's kits. Languages: Elisians can speak, read, and write nesaenae and one other language of their choice. Nesaenae is a nasaly sounding language with intricate grammer and rythmic speech patterns. It is commonly adopted and used in the prayers of human clergy devoted to the Angelic Host.